The recommended direction of travel with an end drive causes the drive pulley to pull the belt. 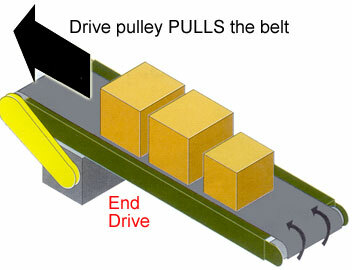 The drive and belt were designed to work together in concert to pull a load, not push it. In this scenario the belting will rarely suffer buckling issues or require maintenance. When a drive pulley pushes the belt, belt buckling issues are more likely to occur. This can cause replacement and maintenance issues. 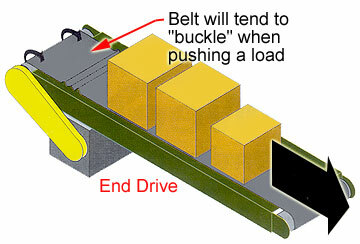 The belt and drive were not designed to push, so they are under more stress. When you need a reversing application, a center drive is recommended. 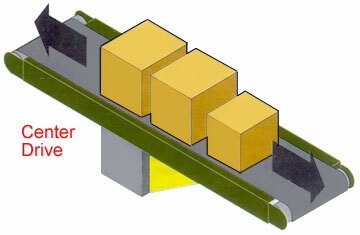 The drive pulley is located at the center of the conveyor and pulls the belt equally at both ends. In this configuration, your belt will not buckle. Correctly specifying drives can reduce maintenance and increase conveyor performance. Contact us with questions about drive locations and specifications.